Barbara Kruger is an American artist who works with pictures and words. Kruger uses the fluency she developed as a graphic designer to inform her work as an artist, insistently addressing the issues of power, property, money, race, and sexuality. Over the past three decades her work has ranged from the photographic merging of image and text, to immersive video installations, to room-wrapping textual exhibitions, to large-scale outdoor displays of words and images. Two of her best-known works – Your body is a battleground and I shop therefore I am – also showcase the feminist overtones of her artworks, and her concentration on women as a lucrative site for advertising and consumerism. For the High Line, Kruger presents Untitled (Blind Idealism Is…), a new work realized as a hand-painted mural. 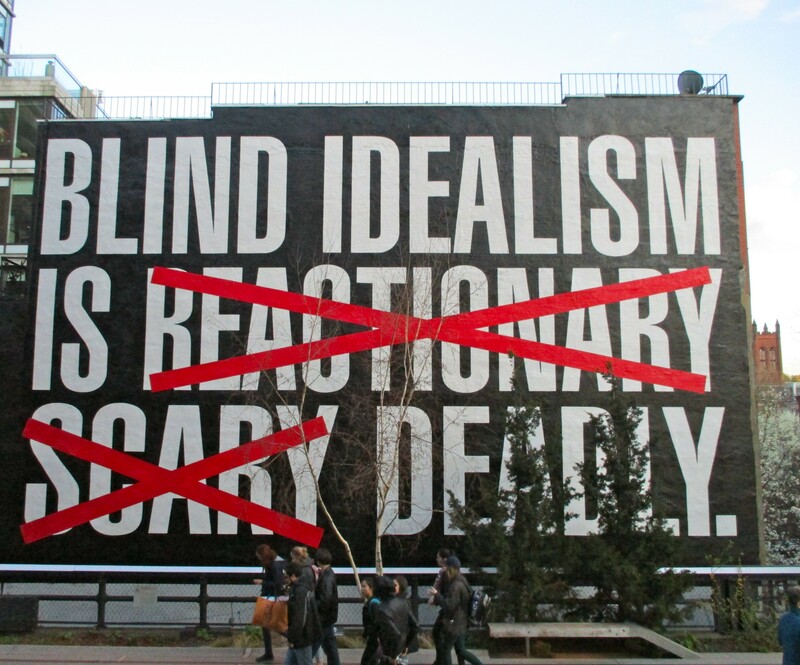 Continuing her unabashed criticism of culture and power, the mural features the slogan “BLIND IDEALISM IS REACTIONARY SCARY DEADLY,” an adaptation of a quote from Afro-Caribbean philosopher and revolutionary thinker Frantz Fanon, which has appeared in multiple works by the artist. The original statement by Fanon, “Blind idealism is reactionary,” suggests that political and religious convictions stem from the situations from which they grow, not from the inherent nature of individual human beings. According to Kruger, the work reflects “how we are to one another” within “the days and nights that construct us.” These texts, along with Kruger’s own writings, resonate with particular potency in today’s political climate. 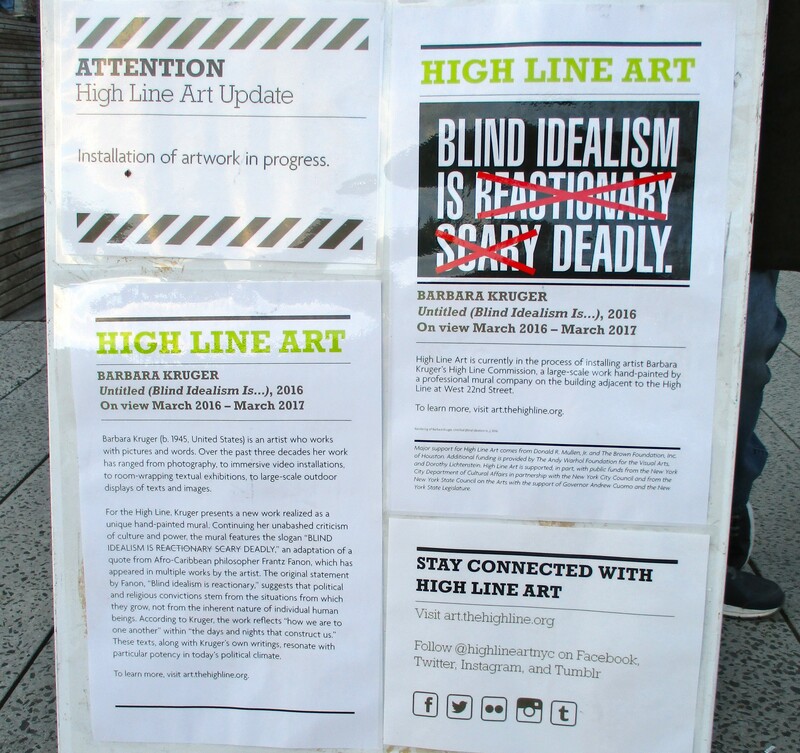 Barbara Kruger’s Untitled (Blind Idealism Is…) Will be on View Until March 2017, Adjacent to the High Line at West 22nd Street., in the Chelsea Gallery District.